Do I have your attention yet? NO??? I know what you're thinking. Me too. 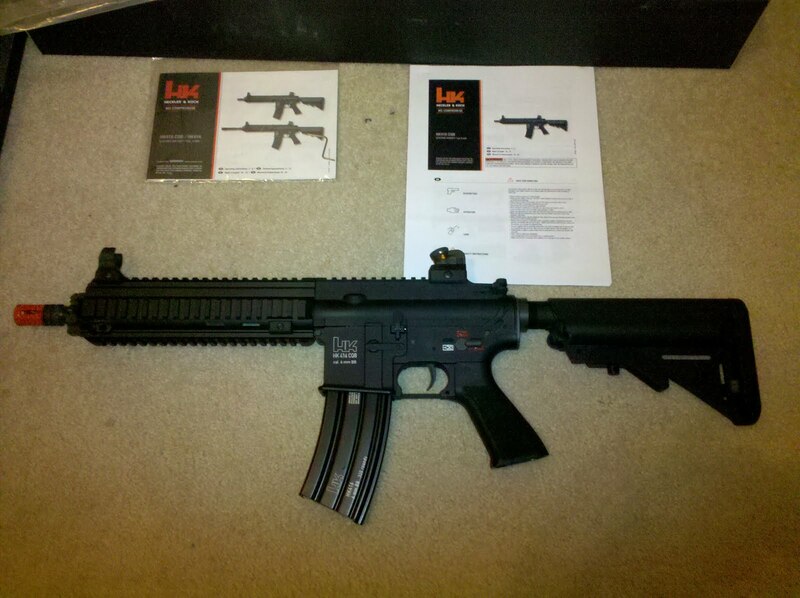 I'm not going to lie...this is a review of the VFC HK 416 CQB and I'm going to tell you how much I love it therein. I've got to be honest with you, sweet little reader. 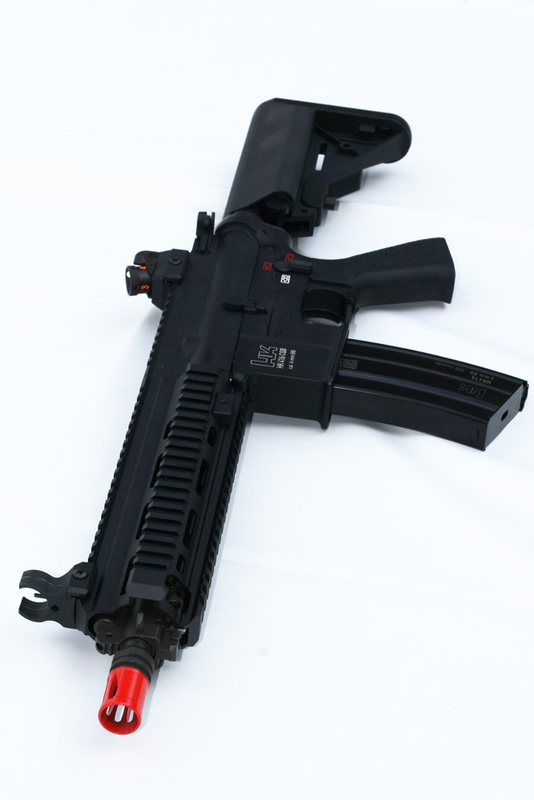 I don't get too impressed by many AEGs these days. 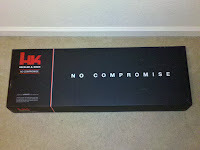 However, VFC has managed to make my list of winners with this rifle. It's solid and really well built, all the way through. 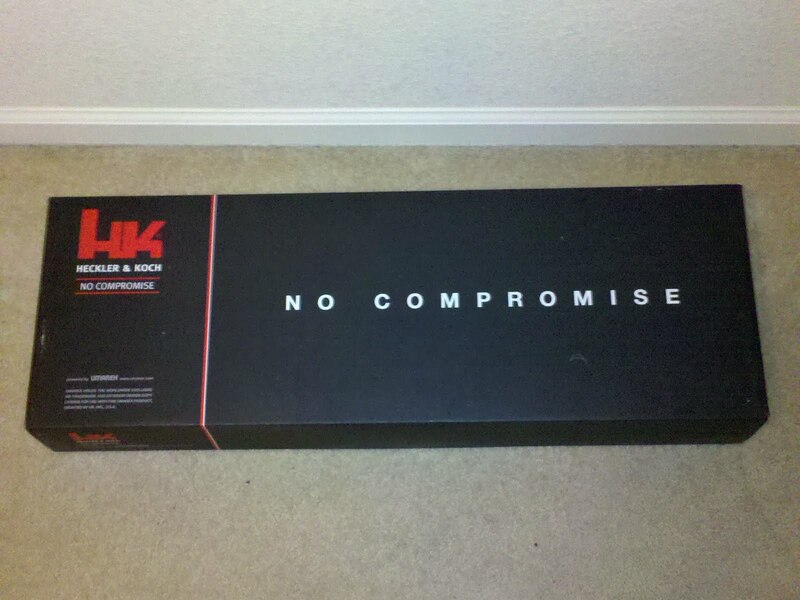 Even the box it came it was attractive. It might be difficult to tell from my horrible cell phone picture, but the box is a nice, rich navy blue color. Click on any of the images below to see a larger view. I know I said I love this gun. But I didn't say it was perfect. I would have preferred whoever (either VFC or Umarex) put all that mag well writing in white text on a sticker instead of printing it directly on the gun. It's basically a warning that this gun is not a toy and stuff. I understand the importance of the message and that the manufacturer/distributor more than likely has some significant legal liabilities that they have to deal with, but I just wish that it was on a removable sticker so that once I read and acknowledged the warning, that I could remove it. 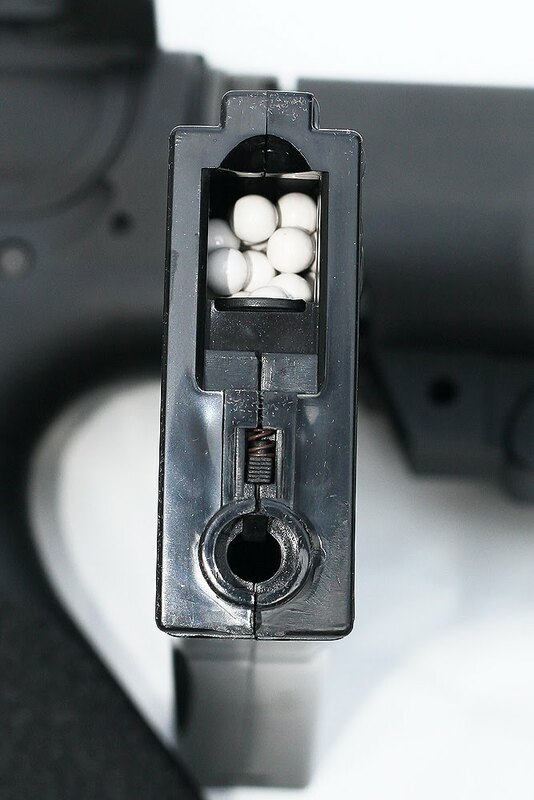 Not a deal breaker from me getting the gun or anything, but just kind of one of those moments where when you first see it, you're like, "Bummer, man." Just like The Dude said, right Denis? 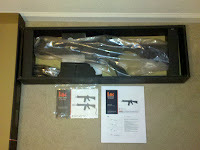 Right side of the rail system below. 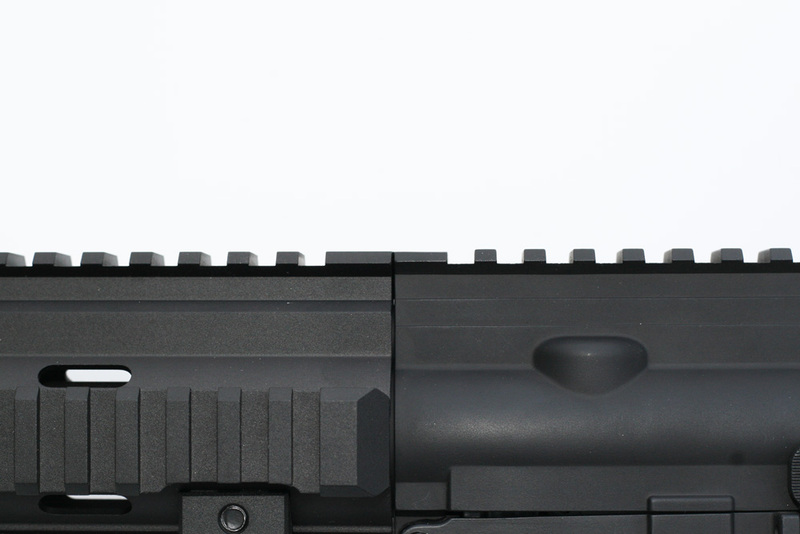 Notice the peculiar looking bolt near the lower left of the rail. 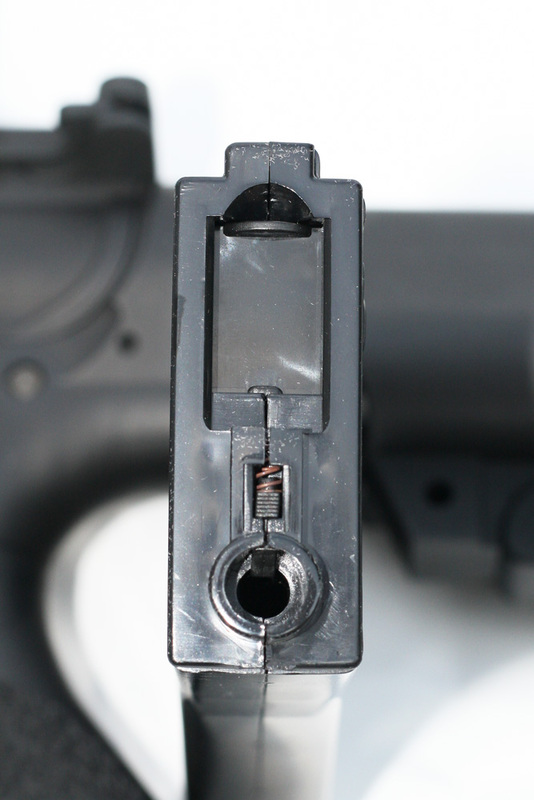 I haven't taken that thing out yet to see what that does, but I have a sneaking suspicion it has to do with disassembling the gun. But I could be wrong, and it wouldn't be the first time. Just ask my wife. 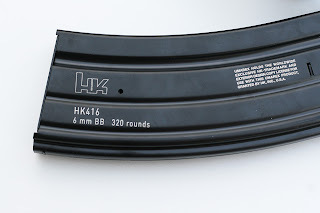 I should tell you that the rifle comes with a little tool in the packaging especially for that weirdy bolt thing, so don't just haphazardly rip open the box when it first arrives at your door-step and ignore any contents that are NOT the rifle itself. You have been warned. You might wonder why I'm so concerned with warning you about that special tool. Well, not that it's ANY OF YOUR BUSINESS, but I did haphazardly rip open the box (to some degree) and ignore the contents at first, which consequently resulted in me losing that special tool. I only know about it because I read elsewhere online that it exists. Shut up. Left side (strong side?) Remember the Titans. 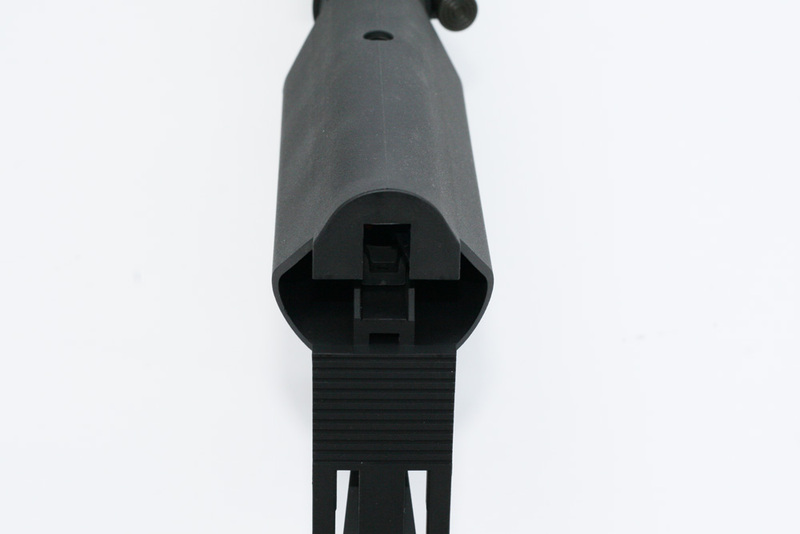 The flash hider is 14mm ***EDIT*** Counterclockwise (CCW), not clockwise like I originally said (thanks Sebastien), so you can attach your favorite suppressors or aftermarket flash hiders (I'd make sure it has an orange tip though. Big brother is always watching). I'd also like to point out that this rifle TOTALLY has the capability to fix a bayonet to it. You know. for those intimate times. I would like to give a shout out to my brother, who loves bayonets (N.H.). 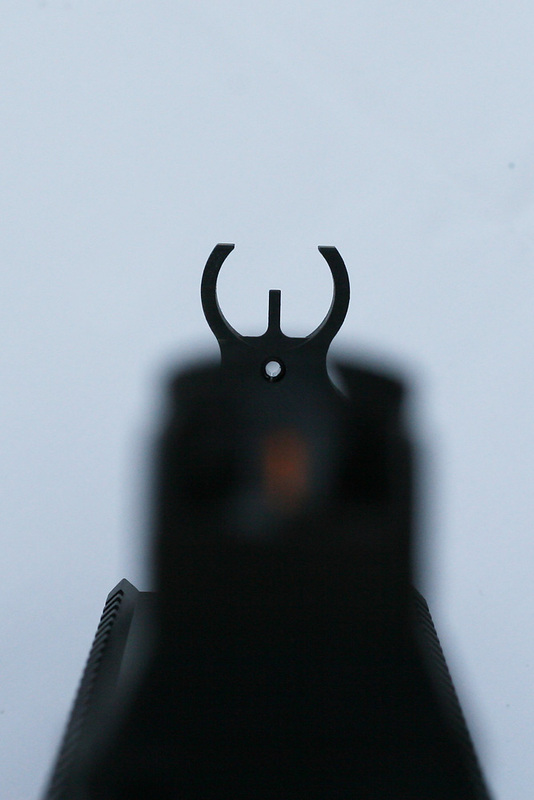 Here's a shot from beneath the rifle, showing that there are sling attachments on both sides. In case you're an idiot and/or weren't paying attention thus far, there's a lot of rail space. 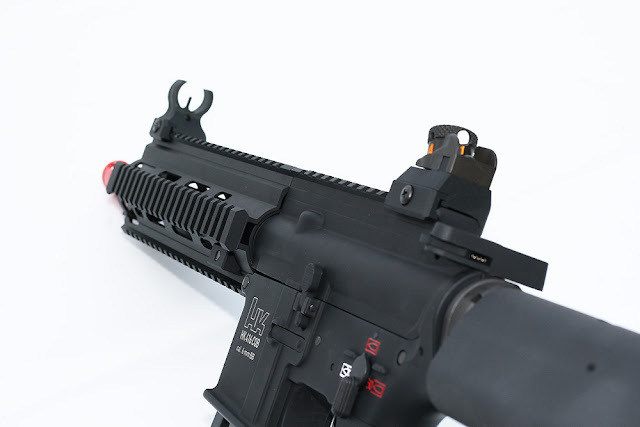 So things like your favorite Dot Sight (Don't you dare put a scope* on this gun), lights, lasers and other tactical treasures will have plenty of room to cohabitate with each other on the VFC HK416 CQB. *A scope is different from a dot sight. 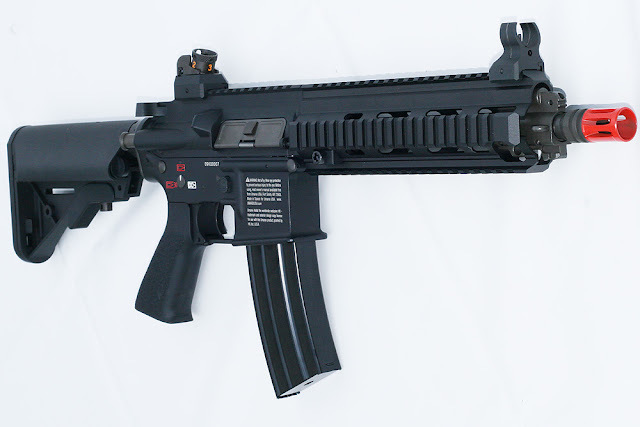 A scope would look ridiculous on this gun. And if anyone knows ridiculous, it's going to be me. 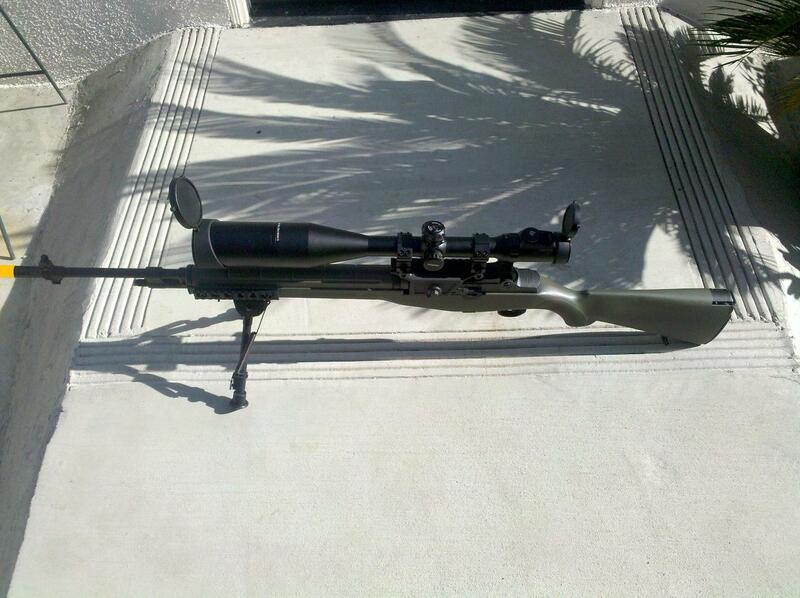 That's an Airsoft M14 with a 6-24x56mm Leapers Scope with a 30mm tube, good for distances out to 500+ yards. 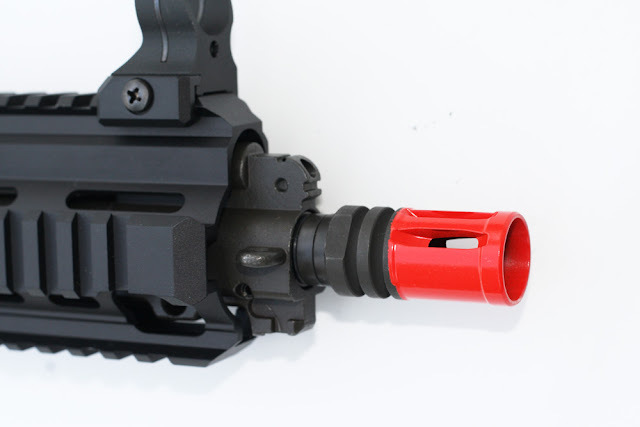 Why do I have it mounted to a heavily upgraded rifle that only does about 80-90 yards on a good day? Because I'm ridiculous. That's why. Note the adjustable rear sight and the charging handle, which pulls the bolt cover back, exposing the hop-up dial. 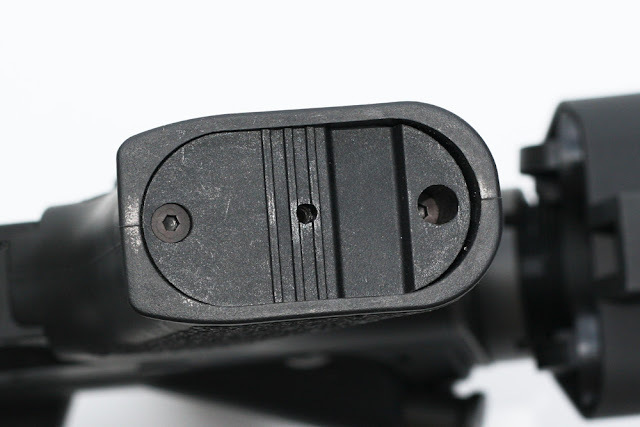 The bolt release button is fully functional, as well. I like the way they did the front sight. In the photo, it looks like I've cut off the top of the circle, BUT IN FACT AND/OR ON THE CONTRARY, VFC did that at the manufacturing plant on purpose. It just looks tight. Tight like a fox. Just my opinion though. 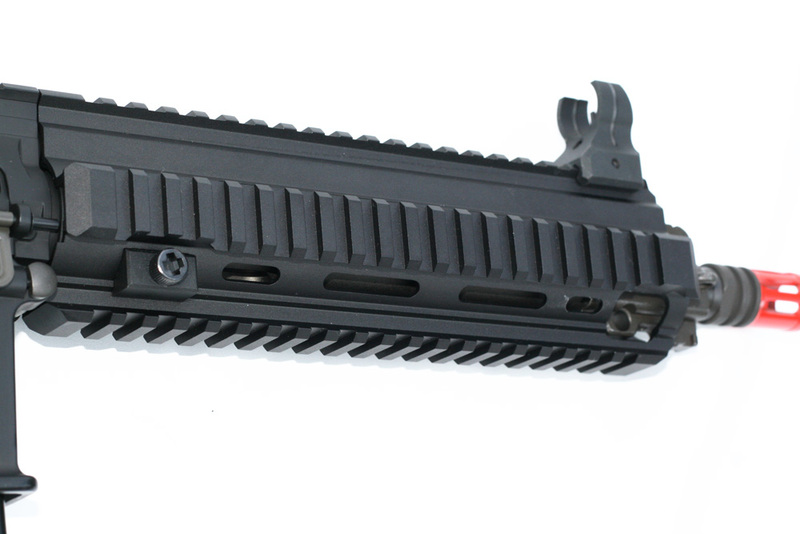 Notice how nicely the rail system sits in line with the upper receiver. 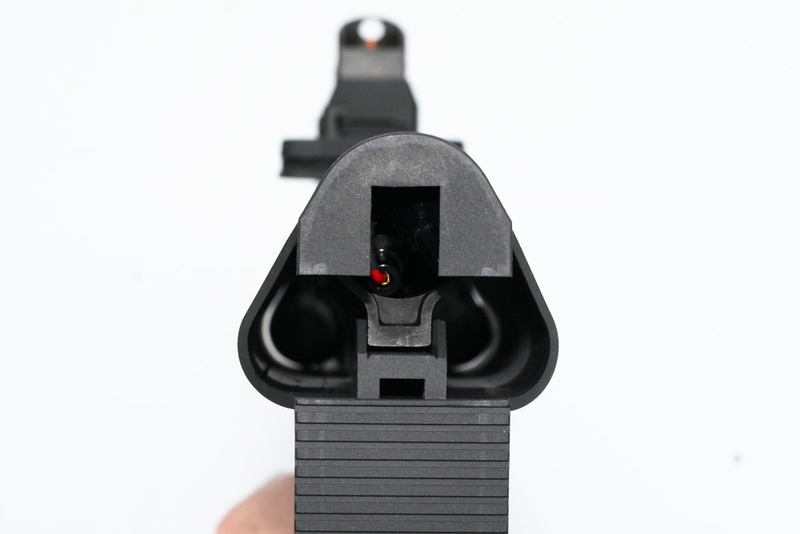 Below, right side of the upper & lower. 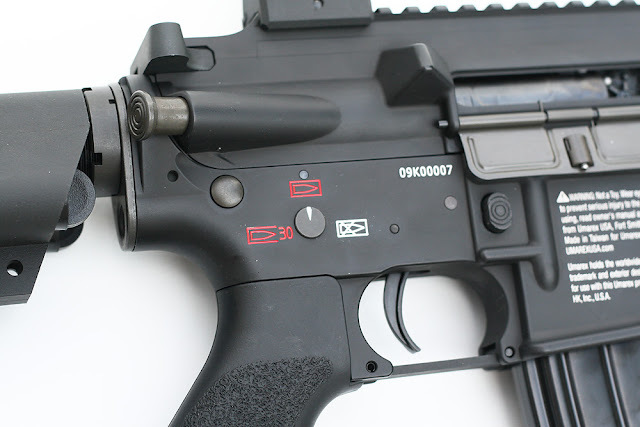 Check out the indicator on the Fire Selector Knob. Not a big deal, just a nice example of the attention to detail that went into making this rifle. 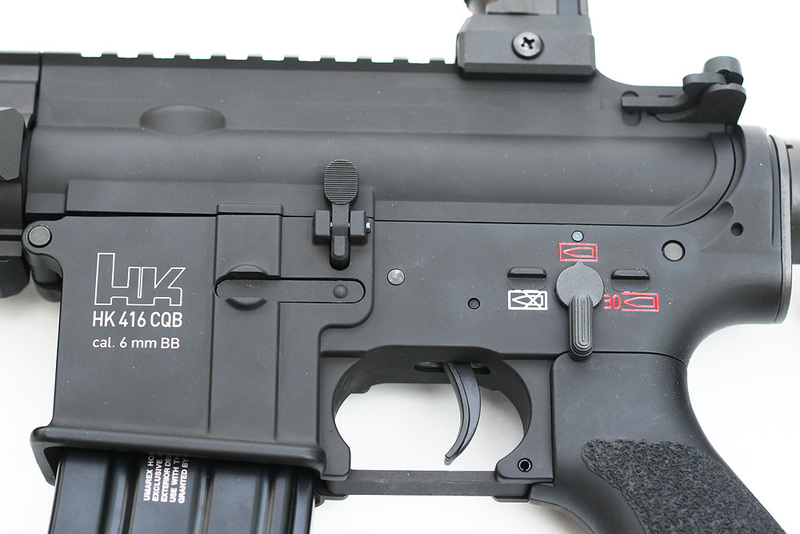 Also, the labels for "Safe," "Semi" and "Full Auto" are engraved into the rifle, then filled in with the red and white paint. Another nice touch. There it is. The hop-up adjustment wheel. It turns pretty well, doesn't seem too flimsy or loose, and stays in place, even when it's turned up high, placing a lot of backspin on the BBs. Below, left-side upper & lower. Those are licensed H&K trades, dog baby. Other items to note are the bolt release button overlapping the joint between the upper and lower, as well as the charging handle up at top right. Both items are fully functional and are used to operate the bolt cover in the image above that allows access to the hop-up dial. Inside the mag well, the hop-up chamber is a clear plastic material. 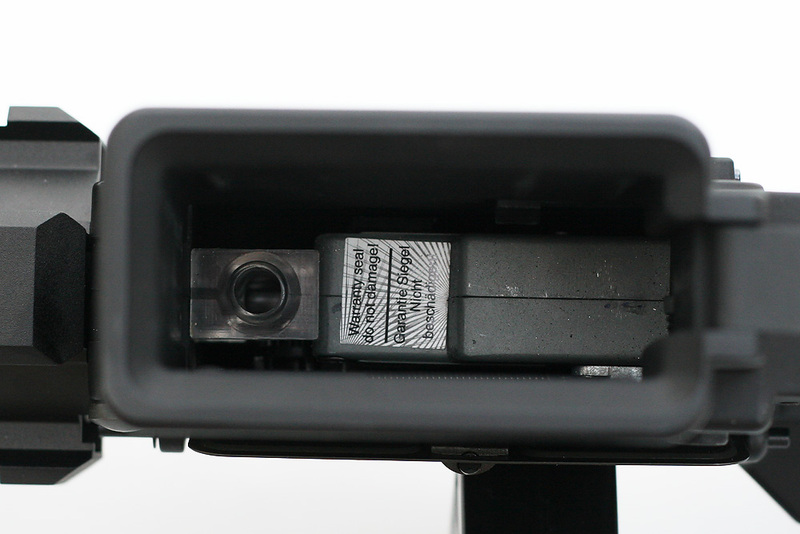 Also visible is the Warranty Seal, that if broken, does something crazy. It voids the warranty! I would like to take a moment to address an awesome situation regarding the seal. It provides the warning in not only English, but also in Deutsch (German, silly). Why is this a big deal? Well...it's not. But German is a very fun language to speak. I took a class on it once, but retained none of the things I had learned after it was over. Bummer. I digress yet again. Back to the gun. 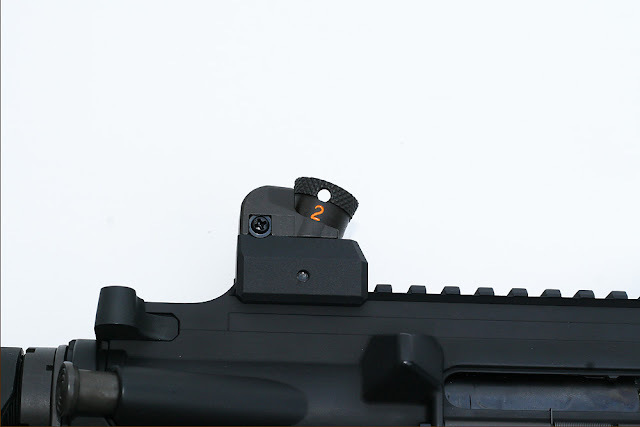 Here is something you don't see everyday on a stock rifle. 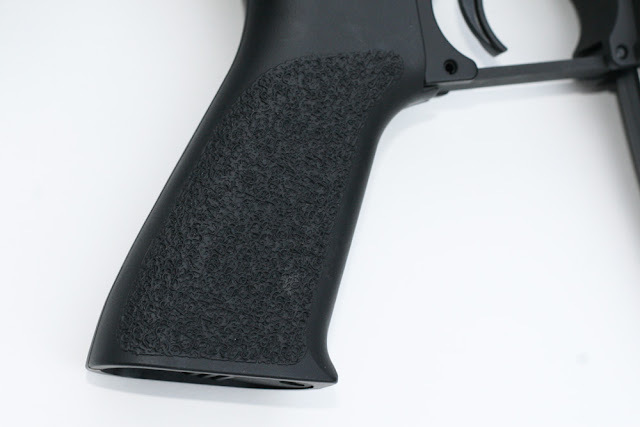 VFC has taken the liberty of stipling the grip, to give it a nice textured feel and providing extra traction for your hand (twss). The manufacturer was also kind enough to allow the user access to the motor height adjustment set screw. You'll need a very tiny Allen/hex wrench, likely in metric size to insert into the hole in the center, below. Turning the screw to the right will raise the motor further into the gearbox, and turning the screw to the left will lower it further from the gearbox. This technique takes some experience, because it involves the ability to audibly assess whether your motor's pinion gear is properly meshing with the bevel gear of the gearbox. This is a whole other topic for another time, but that's what that set screw is for. Accessing the battery space in the crane stock. In the center space, aka the buffer tube, you can just start to see the wiring for the battery. 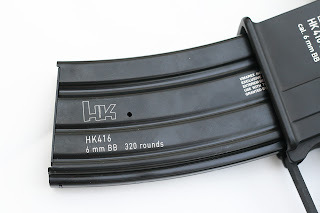 The mag is pretty solid and of course, made of metal. It has a nice, fairly high black gloss finish to it, not to mention the licensed HK trades, you see above. Here is where I start to ask the question, "What in the world?!" 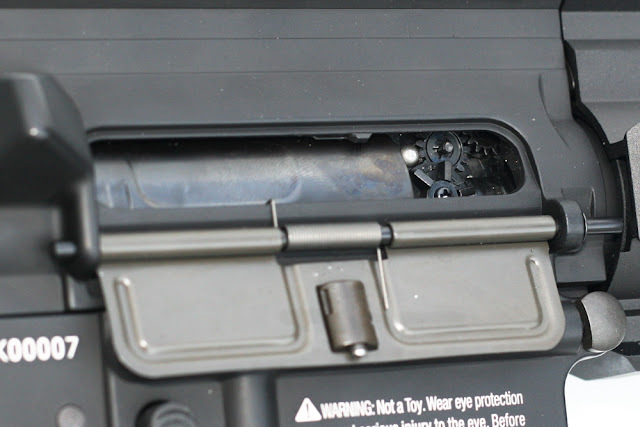 In photo 1, note the rubber circle plug in the base of the magazine. 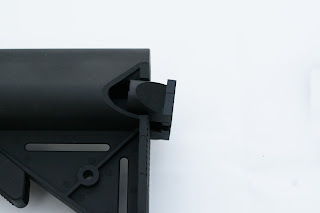 In photo 2, I have removed the rubber plug and placed it on the base plate. 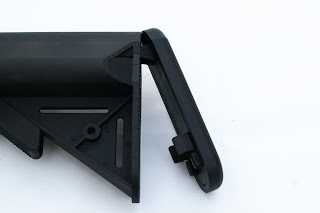 Below, I have removed the base plate by sliding it up, then pulling it out. Removing this plate reveals the winding wheel for the magazine. Bear in mind, this is a wheel that you will undoubtedly need to access during the middle of your game, to rewind when your BBs stop feeding. 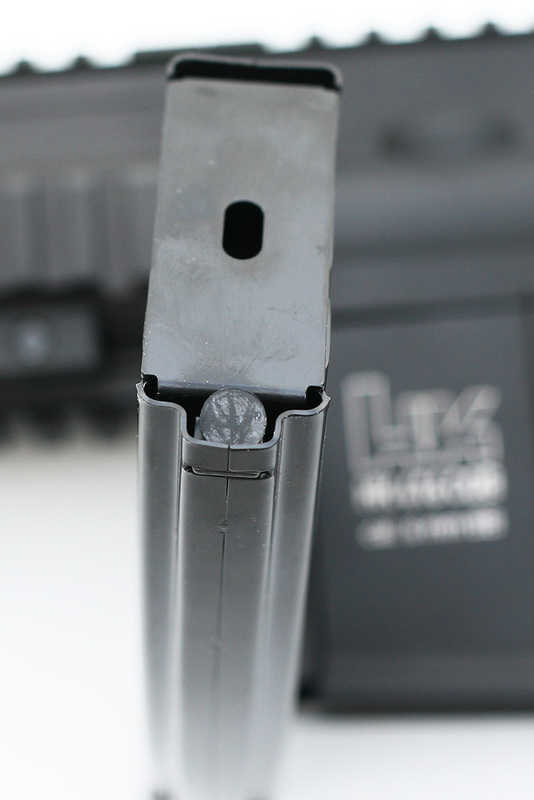 Winding the wheel until it makes that tell-tale clicking sound will not feed the entire mag of BBs into your rifle. So I'm not sure why the manufacturer made it so difficult to access quickly. And don't even bother trying to remove that rubber plug with gloves on. You'll need to remove them to use your fingernail. Unless you use fingerless gloves. My solution is to simply leave the plate off when I play. 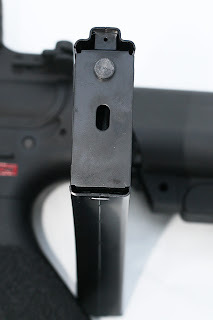 It's not like anyone's really going to see the bottom of your mag anyway, nor would most people notice that the plate is missing. EDIT: It was brought to my attention that this rifle comes with a little wrench for winding the mag. 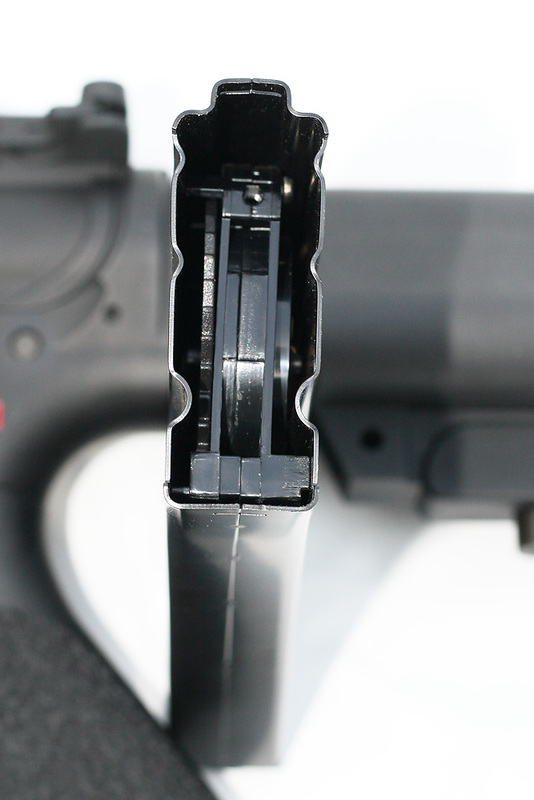 It is SUBSTANTIALLY quicker than having to manually wind the mag. 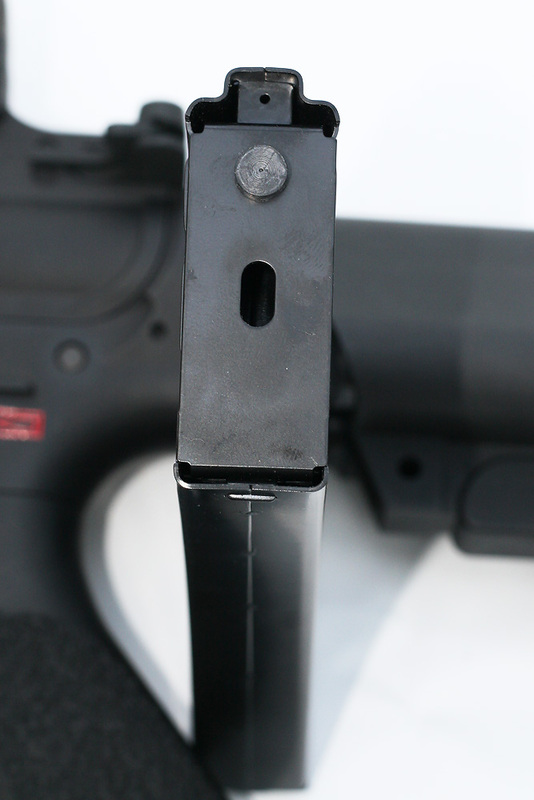 You'll notice the little hole in the side of the mag, seen pictured above. That is where you insert the winding wrench. 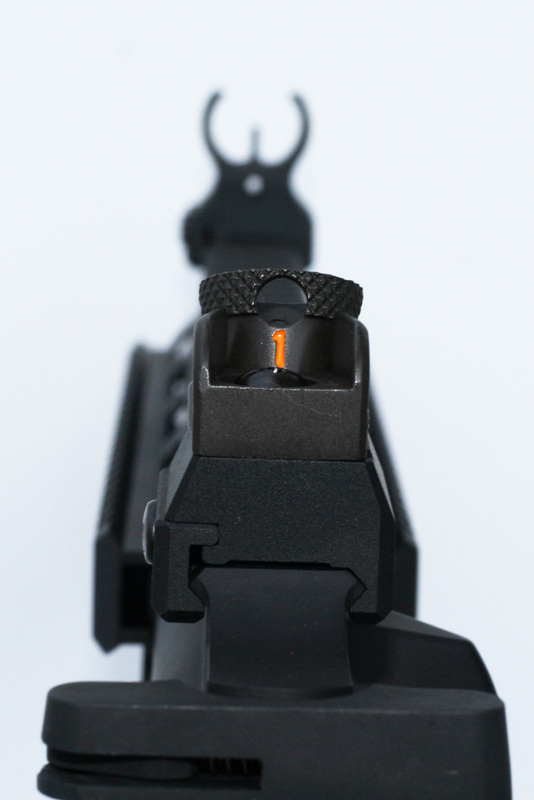 Here is the top of the mag. As you can, it bears a striking resemblance to many of the other M4 Airsoft magazines on the market. 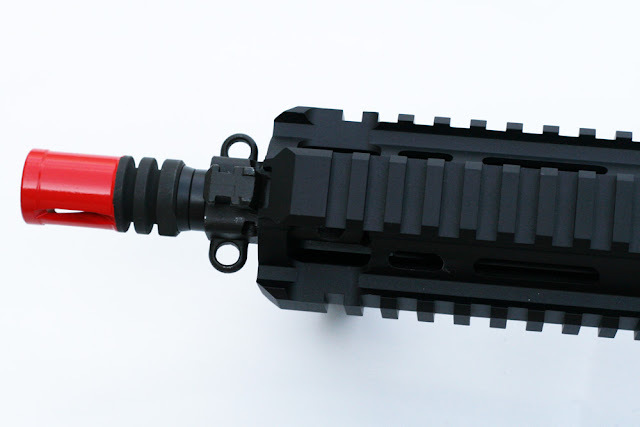 In fact, the resemblance is so striking, it's pretty much going to be compatible with most Classic Army/Echo1/Tokyo Marui-type M4-style AEGs. 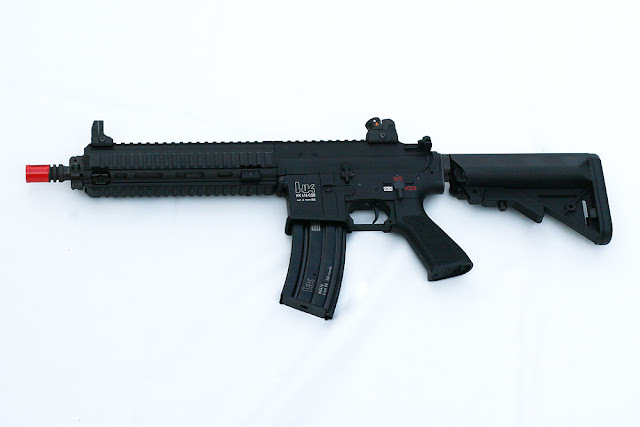 Comes with a limited warranty, provided you don't "break the seal"
The VFC HK416 CQB rocks my heart and mind. In case you don't feel like scrolling way up to the top to check out the product page, I've included it here for your convenience. 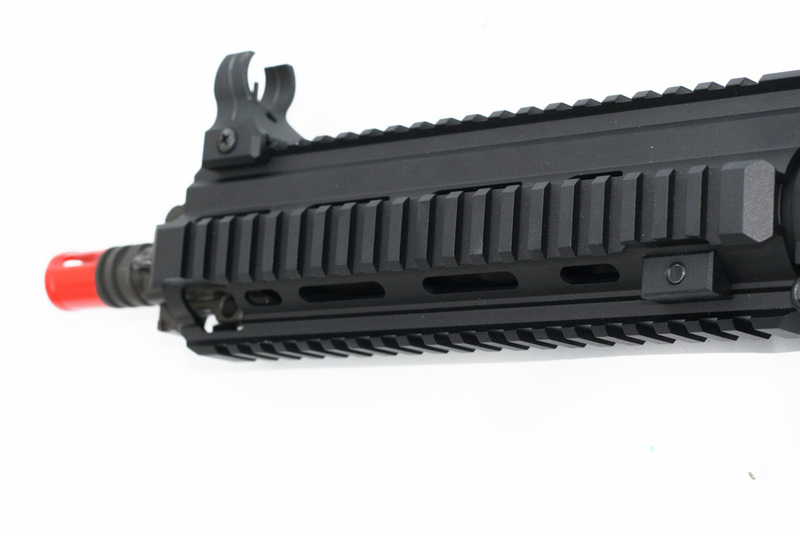 VFC HK416 CQB Product Page for those too lazy to scroll up. Part II with chrono and performance results will be forthcoming shortly. Grab a snickers.